Boys toddler hats not only make a cute head topper for active little ones, they also serve a functional purpose. Boys' hats are available in styles that work year round to keep your child warm, dry and fashionable. Is there anything more adorable than a toddler boy wearing a cute hat? Based on looks alone, there are plenty of acceptable hat options on the market. Identifying the purpose of the toddler hat helps narrow down the selection. Does your toddler need a warm winter hat? Does he need a rain hat to keep his head dry as he splashes in puddles? Do you want a cute accent for a special outfit? Think about how the hat is used when narrowing down the field. Before you purchase a hat for your toddler son, you'll want to consider the options available. The style of hat is only one aspect of the decision. Consider these other factors that influence the selection of toddler hats. Material: Consider the type of material when selecting a hat for your toddler. 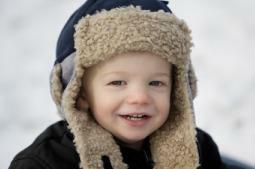 Common materials for toddler boy hats include fleece, knit, wool, corduroy and leather. Each offers a different look and amount of warmth. Color: Choose a color that goes well with the child's jacket if it is for cold weather. If the hat is mainly for fashion purposes, choose fun colors that appeal to your toddler. Patterns: Patterns to the hats add another style option to consider. In addition to stripes, polka dots and other popular patterns, toddler hats often come with popular kids' characters on them. Sizes: Most toddler hats are sized the same way as clothing. It's still a good idea to try the hat on your son before making the purchase. The sizing may vary between brands. Toddler heads also vary greatly in size. Hats for toddler boys are available in a variety of stores, both in person and online. Start with the stores where you normally shop for your child. Discount stores, department stores and children's specialty shops all carry at least a few hat styles. Stores such as Children's Place, Gymboree, Old Navy and Baby Gap typically offer fashionable hat styles at a reasonable price. Online specialty stores are an alternative if you're looking for one of a kind toddler hats. Here are just a few of the many online stores that sell unique hats for toddler boys. Beanie Designs: This family-run company creates adorable handmade, crocheted hats in several colors, patterns and styles. They even have hats that look like pumpkins, apples and other fruits. The hat sizes range from newborn to 5T. Little Lids: This hat shop offers fashion hats for newborns to age 10. You'll pay more here than you would at discount or department stores but you'll also find more fashionable choices. Cabela's: Here you'll find a wide selection of hats for toddler boys ranging from warm winter hats to baseball caps. The advantage of shopping on a website such as Cabela's is they carry a variety of brands in one location. Little Fit: This fashion-focused kids' hat shop sells baseball and trucker style hats for youngsters. Many of the hats include fun graphics such as "ABCD" in the style of the AC/DC band logo or the words "Skate or Cry". Etsy: A search for toddler hats on the Etsy website pulls up several handmade options in a variety of styles and patterns. Many of the hats are affordable yet unique, making it a good alternative to the mass produced hats in big name children's stores. Boys toddler hats finish off any outfit with a fun and stylish detail. Whether you need to keep your little man's head warm, dry or just cute, knowing where to look helps find the perfect hat.